I love digging deep and teaching my students about the dangerous world of credit cards, consumer debt, and borrowing money. Danny Schechter's In Debt We Trust: America before the Bubble Burst documentary is a perfect vehicle for introducing this complex topic. Made in 2005, this documentary is free on youtube and goes deep into the lending practices of credit card companies and other financial giants. As the first section of the film focuses on the effects of consumer debt on students and young families, it's both relevant to students and a yearly favorite lesson of my seniors in Economics class. The second half of the film focuses on the lobbying in Congress and effects of lending on minorities and the wider economy. With this in mind, the film can work as both an introduction into the world of credit cards AND as a deeper look into how Washington and the economy intersect. Though this film was made in 2005, it predicts many of the issues that caused the Great Recession. For this reason, the film also fits into a unit about recessions, bubbles bursting, or macroeconomic policy. 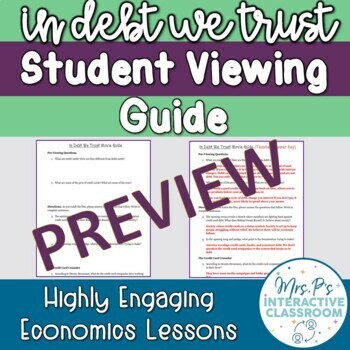 This student viewing guide begins with two questions that draw on students' prior knowledge about credit and debit cards. I use these questions to explain how banks and cards work once students finish writing. Then there are 28 questions broken down by section of the film that ask students to process what they're learning as they watch. I like to pause the film after each section and discuss what we've learned. Finally, there are two reflection questions at the end that allow students to record their key take-aways. The film is roughly 90 minutes, but I like to pause and discuss as the film progresses.